Rushden Town Council provides your local services. 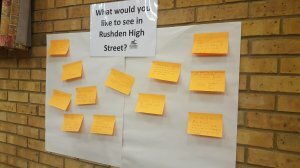 We strive to make Rushden a better place to live, work and play. Our website includes a wealth of information about how we conduct business and what we do. Use the search or browse the site to find whatever you are looking for. 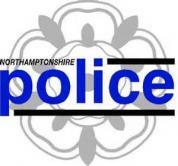 If you can't find the information you require then please contact us. 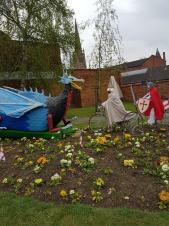 The bikes in Rushden were decorated to celebrate St George's Day! Following the success of the recent YourTown NN10 Community 5k run held in March, Celebration Rushden includes a second NN10 event aimed at children. We have various events on offer to suit all ages and tastes, and nearly all of the events are free of charge to people who wish to come along. Just a few events are bookable so please look out for the brochure with details of over 40 local events which will be available from May. Copies will be sent out with the Rushden Reporter and will be obtainable from Rushden Town Council at Hall Park. Activities range from the annual Soap Box Derby, Musical evenings with jazz band, swing band, ukuleles, organ and choirs, a fun Junior Community Run, Festival days, fetes, open days and a Father's Day Car Rally. At the Soap Box Derby on Sunday 9th June we would love to see some new karts entering the race. The biggest trophies in the area plus cash prizes are up for grabs by entrants and creators of innovative and crazy cart designs. If you are a local business, community group or a family wanting a bit of fun why not start building your own Soap Box and enter the exciting Rushden Soap Box Derby. Karts run in twos, and there are classes for children and adults. More details and the rules can be found on our website. For further information or help please contact 01933 316216 or visit our website at www.rushdentowncouncil.gov.uk/events The deadline for all Kart entries is 3rd June so there is still plenty of time. We are pleased that Kingtools of Rushden are once again our main sponsors with additional support from Santa Pod and AJ Cycles. Following the success of the recent YourTown NN10 Community 5K Run held at Rushden Station in March, Celebrate Rushden includes a second NN10 event which is aimed at children. Anyone up to the age of 18 can enter and children are welcome to run with parents or family members if they wish. The Junior 2K Community Run is taking place at 10am (registration from 9am)on the morning of the Soap Box Derby in Hall Park. The run is Free to enter but please register online www.yourtown.community/NN10/ All participants will receive a medal and a goodie bag for taking part. This event has been organised as part of Celebrate Rushden week by Freedom Leisure, East Northants Council and Rushden Town Council. We look forward to seeing you at some or all of the events on offer during our Celebrate Rushden week and please jot the dates in your diary, Saturday 8th June to Sunday 16th June and come along to enjoy the fun. And keep a look out for the brochure! Another great day not to be missed is Rushden's biggest event of the year, Party in the Park which is taking place on Saturday 13th July at Hall Park, 1pm until 10pm. Rushden Town Council is very pleased to present our second 'Celebrate Rushden' week of events, albeit it is really our 7th since we started in 2013 with 'Get to Know Rushden'! The big change this year is that with the Soap Box Derby getting larger we gave moved it to a Sunday to give much more time for the races. There will also be some displays in the park and other attractions on the day. So please bring the family along for a fun afternoon. Last night's public meeting at the Wesleyan Church Hall was well received. Good to hear the many ideas from local residents and businesses. Tuesday 9th April 2019 at the Wesleyan Church Hall, Queen Street, Rushden starting at 7pm. Your views are very important to us and we will be pleased to see you at this meeting. HTML5 validated. WCAG compliant. Page generated in 0.2097 seconds.